Elvis Costello has always had a knack for rewriting history-it was only a manner of time before he rewrote his own. When last we heard from him, he was teaming up with Allen Toussaint, revitalizing some old Toussaint chestnuts and spicing them up with a few new tunes for an album, The River in Reverse, that updated classic soul and R&B sounds for a timely and timeless homage to New Orleans and life in the strange new world of the 21st century. And that wasn’t the first time he’d recast musical history in his own image; over the past three decades, he’s given similar extreme makeovers to country, classical pop, torchy jazz… heck, he even coaxed out of Burt Bacharach a set of songs that sounds as good today as it would have in the 60s. But somewhere amid all the genre-hopping, listeners began to fear that he’s lost track of his own musical roots, something he rectifies on the quickly-recorded and rush-released Momofuku, a revisionist history that filters his early records through everything he’s done in the meantime. It’s a neat trick, because the album feels like a natural progression, an extension of his recent genre exercises, not a retreat and certainly not a reinvention. It has a natural, organic feel that makes it feel very much like he’s playing to his strengths and doing what he does best, but it also avoids sounding very much like any one Costello record in particular. And that’s because it’s really not like any other Elvis Costello record-not really. 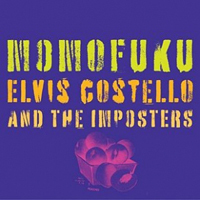 The obvious touchstones are his first two albums, My Aim is True and This Year’s Model, but it’s a much looser and lighter set than either of those albums; where those albums found Costello hiding his pop instincts behind snarling vocals and reckless, careening rock and roll performances, Momofuku makes no pretense of being punk or New Wave-it’s essentially a set of unpretentious pop sing-alongs, emphasizing melody over attitude. Trust and Spike might also seem like fair comparisons, but this album isn’t quite as eclectic as the former and it hangs together much better than the latter. No, this isn’t a throwback to his glory days; rather, it’s a re-imagining of those early albums in light of the weird detours he’s taken since then. The opening trio of songs-”No Hiding Place,” “American Gangster Time,” and “Turpentine”-are typical Costello rockers, only the rock is toned down to keep the emphasis on melody and pop hooks. From there, he channels his pop sensibilities through jazzy shuffles (”Harry Worth”) and old-timey soul ballads (”Flutter & Wow”). There’s plenty of country twang, too, whether in the acoustic “Monkey to Man” sequel “Drum & Bone” or the strutting Loretta Lynn co-write “Pardon Me, Madame, My Name is Eve.” The ingredients here are all familiar, but we’ve never heard Costello put them together quite like this before; he brings to these songs not the manic energy of his earliest works, but the writerly songcraft and sophistication he’s been cultivating through his classical, jazz, and operatic works. His Imposters provide the kind of versatile and graceful arrangements these songs need, and a vocal supergroup-including Rilo Kiley’s Jenny Lewis-make sweet harmony in the background, making the whole thing feel a bit like a community sing-along. Lyrically, Costello can still bring the venom and bile better than anyone-whether he’s railing at the Internet, his critics, a deceitful lover, or modernity itself- even if these new songs are more about craft than raw anger; he even provides a direct answer to an earlier song, “The Long Honeymoon,” in the domestic discord of “Harry Worth.” And those projects with Bacharach and Toussaint have turned him into a real singer, too-he can do a lot more with that mouth of his than just snarl and spit. But while all these things are fine and good, the album’s laid-back, easygoing charm proves to be both its greatest virtue and its greatest vice. For the first time ever, Elvis Costello has made an album that doesn’t assert itself-either through sheer, brute force or conceptual thrust-which means that, on first listen, these songs feel like just that, a batch of songs. There isn’t the careening energy or the bristling anger of earlier Costello albums that immediately grabs you, nor is there some the musical experimentation to announce itself as a major work. It’s simply Costello and some friends, making a loose, unself-conscious set of songs, which means that it feels a little slight at first, but because these compositions are so sophisticated and the hooks are so strong, the album quietly takes its place as one of the most enjoyable and compulsively listenable Costello albums in many years, a low-key delight that isn’t as modest as it first seems.